After a winter of sitting my natural indigo pot is being re-awakened. I kept it warm with a fish tank heater over the winter, which seems to have worked. It looks the best it has ever looked. 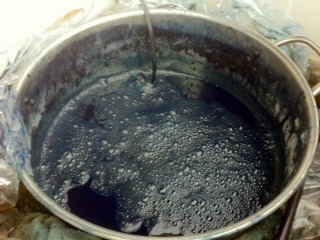 The true test will be some indigo dyeing, hopefully next Sunday. Stay tuned! mmm luscious indigo. hope it works well for you.